The hydrangea garden blooms in June. You can take a seat in the garden or enjoy strolling among them in full bloom. Fujinomori Jinja 「藤森神社」 is an ancient shrine located in southern Kyoto. Fujinomori Shrine is said to have been founded by Emperor Jingu. It enshrines the victorious battle flag and 12 deities here. The origin of Children’s Day (5th, MAY) was born at this shrine, and today Fujinomori Shrine is well known for hearing prays of victory, studies, and horse racing. The shrine’s grounds are made beautiful with a hydrangea garden, containing 3,500 hydrangea plants in a variety of colors from pink and blue to white. 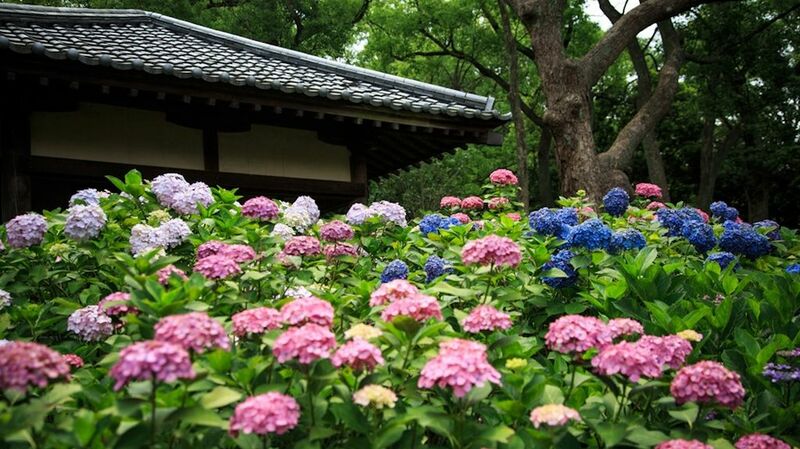 The hydrangea garden blooms in June during Japan’s rainy season. You can take a seat in the garden or enjoy strolling among them in full bloom. The shrine holds a Hydrangea Festival during the season. Japanese traditional performances such as tea ceremonies, Shinto rituals will be held at weekends during the festival. Fujinomori Matsuri Festival is held at Fujinomori Shrine every year from MAY 1 to MAY 5. During the festival, there are many food stalls in the precincts, and portable shrines are carried around the shrine. There are also Japanese drum performances, and a samurai parade. The highlight of this festival is “kakeuma-shinji”, acrobatic horse-riding ritual. It has 1,200 years history and was originally a ritual to pray for the safe return from the battlefield and victory for the samurai. You won’t miss the riders show their acrobatic skills on horseback.